I wrote about this recipe, from the new edition of Canal House Cooking (Vol. No. 3), a few weeks ago. In that post, I said I’d be haunting the produce section of Whole Earth Center to find these young onions, and, sure enough, when I remembered to check one day, they had gorgeous red ones. 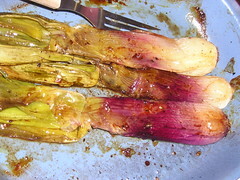 I took them right home and roasted them according to that very easy recipe, and – oh my! So simple, so very, very delicious. This is, to me, the essence of of-the-moment seasonal cooking, and that has a lot to do with my admiration for the Canal House Cooking series. They just seem to get it right! 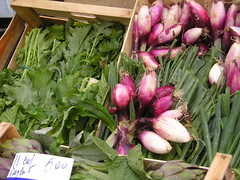 Here are the spring onions I photographed in Florence several years ago (in November yet! ).